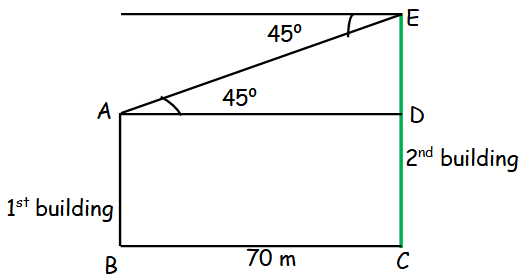 From the top of a rock 50√3 m high, the angle of depression of a car on the ground is observed to be 30°. Find the distance of the car from the rock. 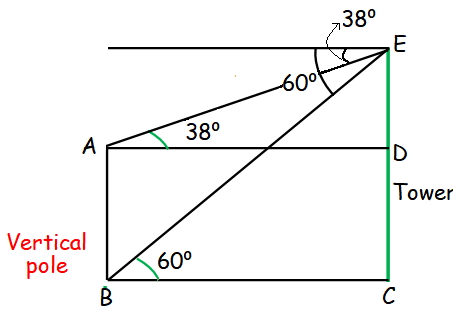 Car in the position A. The distance of the car from the rock is 150 m.
The horizontal distance between two buildings is 70 m. The angle of depression of the top of the first building when seen from the top of the second building is 45°. If the height of the second building is 120 m, find the height of the first building. 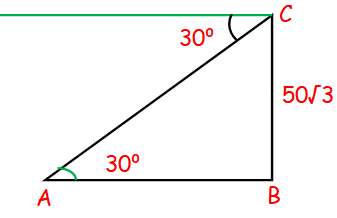 After having gone through the stuff given above, we hope that the students would have understood, "Trigonometry Word Problems with Angle of Depression". 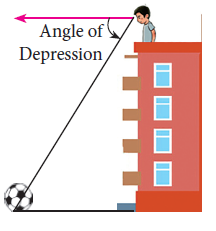 Apart from the stuff given in this section "Trigonometry Word Problems with Angle of Depression" if you need any other stuff in math, please use our google custom search here.